This website has been set up to provide access to the St Andrew’s School for Girls’ Digital Archive which is hosted by Africa Media Online. Please register and log in for maximise access to the site. Many features will otherwise be blocked from view. Your comments and suggestions are welcome. Please email the School Archivist at archive@standrews.co.za or use the online form under ‘Contact Us’. St Andrew’s School for Girls MAY AMEND THIS POLICY AT ANY TIME. AMENDED TERMS SHALL BE EFFECTIVE IMMEDIATELY UPON THE POSTING OF THE REVISED POLICY AND ANY SUBSEQUENT ACTIVITY IN RELATION TO THE WEBSITE SHALL BE GOVERNED BY SUCH AMENDED TERMS. IF YOU DO NOT AGREE WITH ANY TERM IN THIS POLICY, PLEASE DO NOT USE THIS WEBSITE. to provide the Archive Content Subjects with direct marketing communications regarding St Andrew’s School for Girls’s activities and news. St Andrew’s School for Girls may also automatically collect and store non-personally identifiable information from Your use of the Website. any additional information that can form part of the archive of St Andrew’s School for Girls. If You are a Website User, You consent to the processing of Your Personal Information specifically including (i) to greet the User when he/she accesses the Website, (ii) to inform the Website User of facts relating to his/her access and use of the Website as well as to assist with problems, (iii) to provide the Website User with access to the Website and the associated Website services, (iv) to provide the Website User with direct marketing communications regarding St Andrew’s School for Girls’s activities and news, and/or (v) to compile non-personal statistical information about browsing habits, click-patterns and access to the Website. If You are an Archive Content Subject, You consent to the processing of Your Personal Information specifically including (i) to compile and maintain an archive for St Andrew’s School for Girls, (ii) to be published in marketing and communications materials, including but not limited to, school magazines, brochures, newsletters and published photographs on the Website or otherwise, and/or (iii) to provide the You with direct marketing communications regarding St Andrew’s School for Girls’s activities and news. By using our Website, You represent that You are of the age of 18 or older or that you have necessary authorisation from a competent person and that you consent to Your Personal Information to be processed by St Andrew’s School for Girls. You expressly consent to St Andrew’s School for Girls retaining Your Personal Information once Your relationship with St Andrew’s School for Girls has been terminated for: aggregate, statistical, reporting and historical purposes. St Andrew’s School for Girls endeavours to comply with all laws and regulations applicable to St Andrew’s School for Girls pertaining to information and communications privacy including, but not limited to, the 1996 South African Constitution and the Protection of Personal Information Act 4 of 2013 (“the Act”). St Andrew’s School for Girls applies the principles of protection of Personal Information under such Act and further legislation referred to in the Act. St Andrew’s School for Girls seeks to ensure the quality, accuracy and confidentiality of Personal Information in its possession. You warrant that all personal information supplied by You is both true and correct at the time of provision. In the event of any aspect of Your personal information changing post submission, it is Your responsibility to immediately notify St Andrew’s School for Girls of the said changes by email to Alison Orpen. You agree to indemnify and hold St Andrew’s School for Girls, its officers, directors, employees, agents, and suppliers harmless from and against any claims, damages, actions and liabilities including without limitation, indirect, incidental, special, consequential or punitive damages arising out of St Andrew’s School for Girls’s reliance on Your personal information should Your personal information contain any errors or inaccuracies. You warrant that You have the authority, permissions and consents to provide St Andrew’s School for Girls with any third party information submitted to St Andrew’s School for Girls. St Andrew’s School for Girls will take all reasonable measures in order to ensure Your Personal Information is appropriately safeguarded, these precautions include, but are not limited to: access control mechanisms via username and password, and software protection for information for security. Should an unauthorised person/s gain access to Your Personal Information St Andrew’s School for Girls will contact You within a reasonable time to inform You of such access. 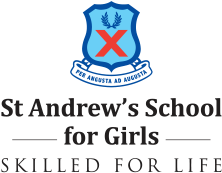 St Andrew’s School for Girls may share Your PersonaI Information with authorised third parties such as service providers to St Andrew’s School for Girls. These include, but are not limited to digital archiving service providers. St Andrew’s School for Girls does not permit these parties to use such information for any other purpose than to perform the services that St Andrew’s School for Girls has instructed them to provide. All processing is compatible with such purpose. St Andrew’s School for Girls may appoint certain agents, third parties and/or service providers which operate outside the borders of the Republic of South Africa. In these circumstances St Andrew’s School for Girls will be required to transmit Your Personal Information outside South Africa. The purpose of the trans-border transfer of Your Personal Information may include, but is not limited to: data hosting and storage. You expressly consent to the trans-border flow of Your Personal Information. The Website may contain links to other websites. St Andrew’s School for Girls is not responsible for the privacy practices of such third party websites. Records relating to the provision of St Andrew’s School for Girls products and/or services by St Andrew’s School for Girls to You and the Personal Information submitted by You is retained for publication on the Website and/or to provide you with the Website services. Such records may be required to be retained in terms of legislated records retention requirements, St Andrew’s School for Girls’ operational purposes and/or for production as evidence by St Andrew’s School for Girls in legal proceedings. In terms of Section 14(2) of the Act records of personal information may be retained for periods in excess of those contemplated in 4.1 for historical purposes. St Andrew’s School for Girls warrants that appropriate safeguards are in place to prevent the records being used for any other purpose. No Item containing the image of or reference to a person is to be used for a purpose other than for which rights are granted by St Andrew’s School for Girls, without prior express written permission of St Andrew’s School for Girls.